There is about to be a discontinuity in how humans and business software applications work together. It is not yet appreciated how collaboration between increasingly powerful applications and humans will offer major advantages and avert problems as we automate the world. 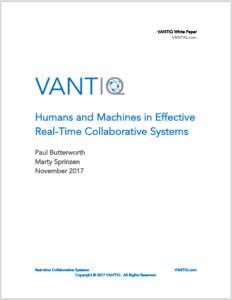 This paper presents a case for real-time collaboration between humans and so-called ‘machines’ —and, why enabling such powerful collaborations must become a priority for enterprises looking to drive their digital businesses transformations.